CAIRO — It was a damaging week for American public relations in the Arab world. 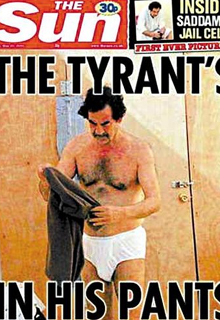 What started with deadly riots over allegations that US interrogators flushed the Koran ended with leaked photos of Saddam Hussein in his underwear. To The New York Post, which first published the pictures on Friday along with its sister publication The Sun of Britain, the photographs were a chance to emphasis Mr. Hussein's crimes and indulge in public humiliation of the former strongman. The Sun and The Post say a US military source gave them the pictures. But for the most of the Arab press the pictures are being treated as a small piece in an overall pattern of alleged American violations of prisoners' rights. And as confirmation, to many, of US contempt for Arabs and Islam. 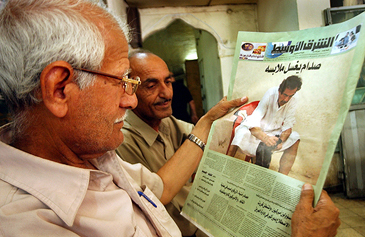 Al-Hayat, one of two major pan-Arab dailies, followed the story on the front page Saturday, with the headline "Pictures of Saddam in His Cell Violate the Geneva Conventions." The paper, like many in the region, didn't show the photos of Hussein. Al Jazeera, the dominant regional satellite news channel, which is frequently attacked by US politicians for alleged bias, has reported briefly on the pictures, but didn't show them. "The picture in itself isn't newsworthy, and we felt that it was denigrating in general," says Jihad Ballout, Al Jazeera's spokesman in Qatar. Mr. Ballout says the decision is consistent with Al Jazeera's general policies, though it has shown pictures of US servicemen and other hostages in insurgent custody in Iraq. How one organization sees the importance of the photos, however, seems to follow how they felt about the US decision to invade Iraq. Al Jazeera has been opposed to the war, and tends to paint Iraq's insurgency as nationalist resistance to occupation. The Sun and The Post, both owned by Rupbert Murdoch, supported the war and tend to paint the insurgency there as Baathist terrorists. The Sun quotes the unnamed source of the pictures as saying: "It's important that the people of Iraq see him like that to destroy the myth. Maybe that will kill a bit of the passion in the fanatics who still follow him." President Bush doubted that the pictures would have much impact on Iraq's insurgency. "I don't think a photo inspires murderers. I think they're inspired by an ideology that's so barbaric and backwards that it's hard for many in the Western world to comprehend how they think." The minor flap over the release over the pictures, which presidential spokesman Trent Duffy said are a "clear violation of [Department of Defense] directives and possibly Geneva Convention guidelines for the humane treatment of detained individuals," has been overshadowed in the Arab media by more serious allegations. Over the weekend, The New York Times reported the results of a US military investigation into a pattern of torture and abuse of prisoners, which led to the deaths of at least two detainees, at Bagram Air Base in Afghanistan. Pakistani and Middle Eastern newspapers have continued to run stories from former prisoners at the US military's Guantánamo Bay detention camp alleging torture and desecration of the Koran. A Newsweek story two weeks ago, since retracted, told of US interrogators flushing the Koran down toilets to break the will of prisoners. Retraction or not, it's become an article of faith in the Arab world. The pictures from Abu Ghraib, the Baghdad prison where US soldiers abused Iraqi are still frequently shown on Arab TV. Most in the region have been disappointed with the Abu Ghraib investigation and sentences so far. Army Specialist Charles Graner, the accused ringleader of the abuse, was sentenced to 10 years in prison in January. Sabrina Harman, the only other soldier yet convicted, received a six-month sentence last week. "The event that had the biggest impact for me was when I saw the pictures from Abu Ghraib in the newspapers," says Samir Naguib, manager of a Cairo mobile phone company. "What do I think of when I hear 'America' now? The global bully." Mr. Naguib, who has vacationed in America and once entertained offers to work there, is among the millions of past admirers of America. A report earlier this month from the Council on Foreign Relations summarizing a series of focus groups in Morocco, Egypt, and Indonesia found that America's efforts to win hearts and minds aren't working. "The growth of hostility to America in Muslim countries increases recruitment, and support for extremism and terror," the authors write. "This hostility is a change for focus group members: Most recall that their earlier attitudes towards the US were quite favorable." Mr. Naguib says the pictures of Hussein aren't nearly as interesting to him as news on Iraqi war casualties, claims of US abuses of detainees, and the Abu Ghraib scandal. "Saddam ... deserves what he gets, but the pictures show that if a person is behind US-controlled bars then anything can happen to him. It's clear now that America isn't very different from the Arab states in this," he says. "The Abu Ghraib trials were only at the level of the soldiers, not raised to the levels of the generals that permitted this to happen."